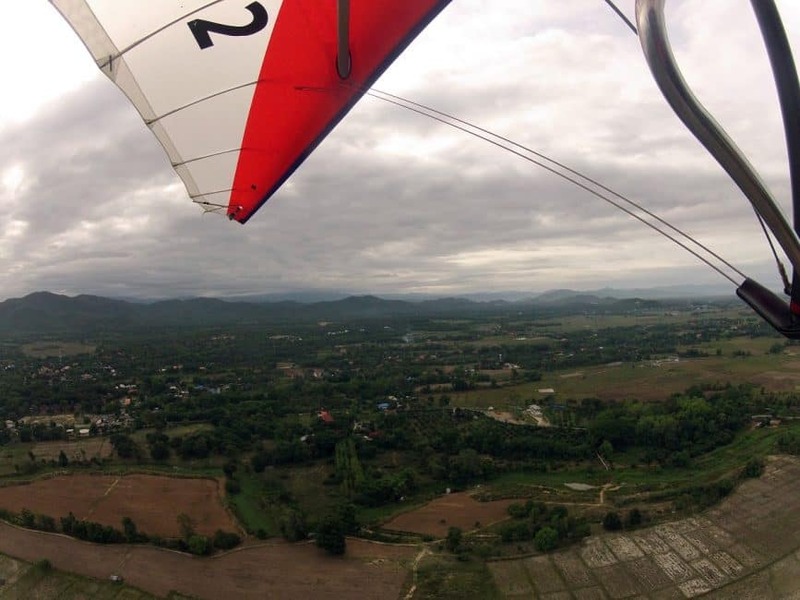 There are so many amazing things to do in Chiang Mai. We've done a lot, but we've also had some Chiang Mai travel Bloggers offer up their suggestions too. Anyone who is planning a visit to Thailand will most certainly have Chiang Mai on their itinerary. There are so many unique and interesting temples, off the beaten path destinations and of course a chance to spend a day with elephants and explore the famous night market. For first timers, you must check out the popular activities, like going on a waterfall expedition, learning to cook Thai food, and spending the evening hours eating and shopping your way through the massive night market. 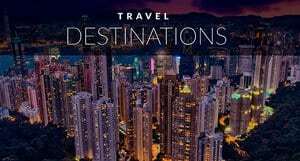 But if you are a return visitor or want to get off the beaten path a bit, these ideas will help you make the most of your stay. By combining our Chiang Mai experiences with suggestions from Latina Abroad, Tiki Touring Kiwi and Together Wherever we've created the ultimate guide to Chiang Mai. 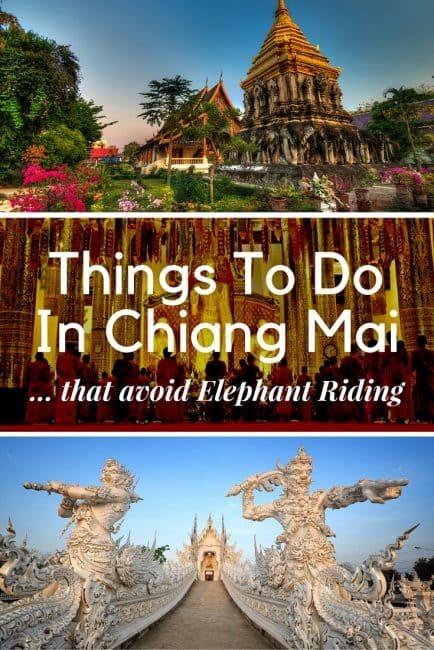 If you would like to skip directly to the Chiang Mai Attraction click the links below. 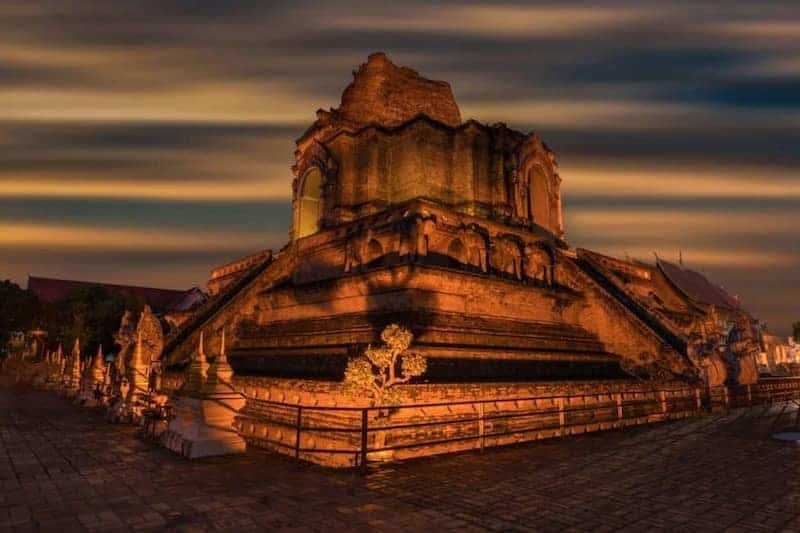 The best time to visit Chiang Mai is from October to February. But any time of year is a good time to visit. Just be prepared for hot temperatures in March and April. Chiang Mai can be reached by overnight train, overnight VIP Bus or flights from Bangkok. 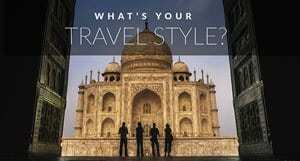 If you are traveling for a short time: Pre-order a KnowRoaming SIM Card to use on your travels. PlanetD readers receive 50% off using our code DDSave50: Details here. Elephants have never gone through a formal domestication process, as dogs and horses have. Instead, they are wild animals that must go through a “breaking” process in order for them to accept a human master, so to speak. Picture a baby elephant being beaten with a sharp, bull-hook-encrusted club. That’s shortly after being separated from its mother, put in a small cage, and left to starve. For days. If a puppy were put through similar misery, I’m sure its “master” would be criminally prosecuted. Why would you give your trip savings to a business that makes elephants suffer? 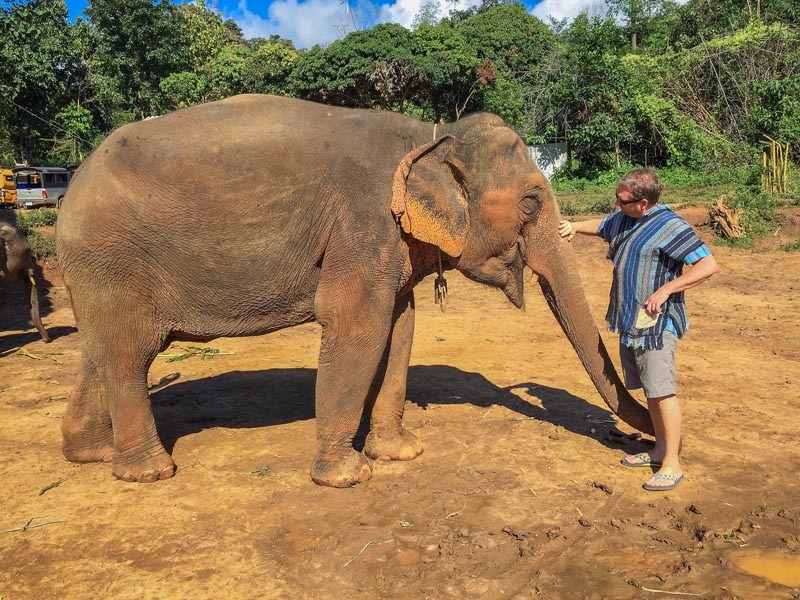 What if I told you there are many other fantastic cultural experiences and natural gems, waiting to be discovered in Chiang Mai, that don’t involve animal cruelty? 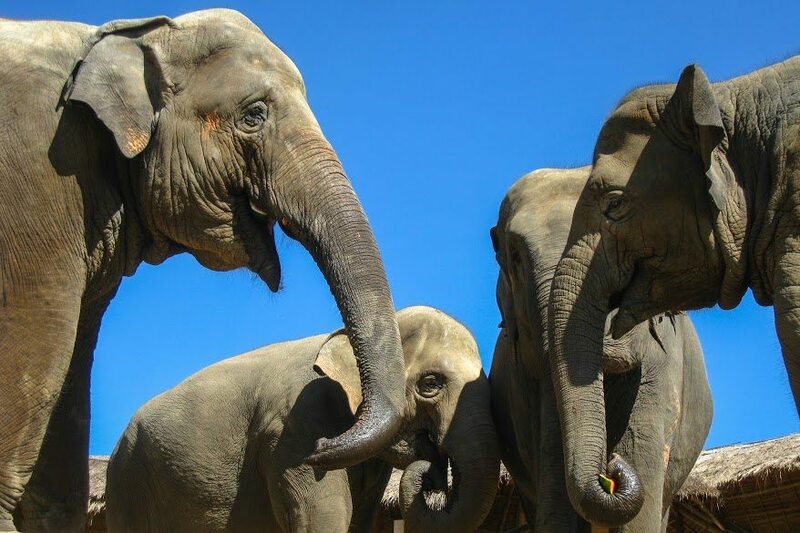 Opportunities to mingle with some of those very elephants, which were rescued by a responsible organization that is now thriving to give them better lives? Be cautious of parks or agencies that claim to be elephant sanctuaries. If they still allow you to ride elephants, they’re not doing their best to protect them. Why? Their spines are actually frail, not built to withstand the weight of an average human being. When doing your research, ensure elephants roam freely around the grounds. Bathing and playing with them side-by-side should be okay if they have been rescued or retired from riding (they’ve already been “broken”). Remember: the performance of any unnatural “tricks for treats” are red flags. 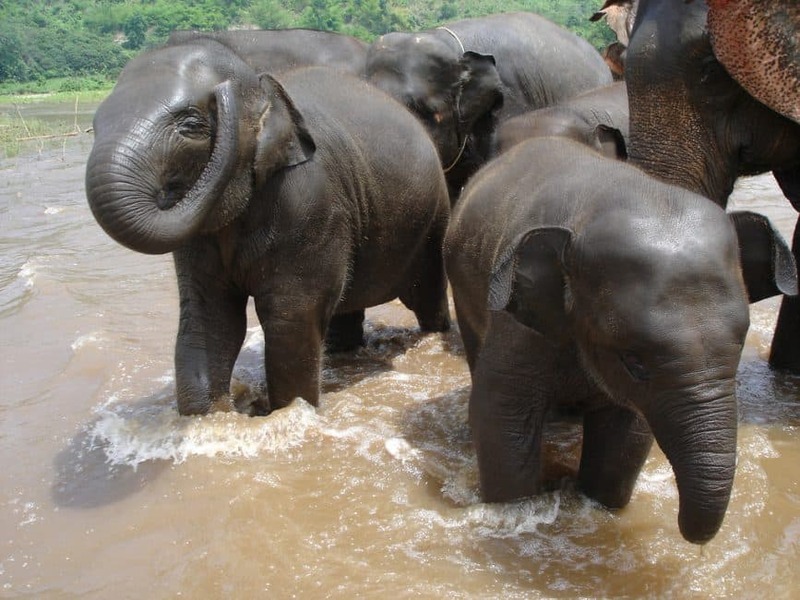 We have used Get Your Guide to book tours and they offer several options for ethical elephant excursions in Chiang Mai. Offering free pick up and you can cancel up to 2 days in advance for a full refund. The most well-known non-profit organization in the area is Save the Elephant Foundation. Founded by Lek Chailert, any funds raised are used to buy elephants from the abusive tourist trade and give them a better home. Better yet? Travelers are encouraged to visit their Elephant Nature Park. There, visitors are able to interact with these beautiful creatures in a natural, safe environment. Win-win for everyone! Wat Suan Dok is another one of my favorite Chiang Mai attractions. Not only is its 14th-century architecture beautifully unique, but members of the late Lanna Royal family are buried around the temple. Better yet? The grounds serve as a monk university, holding daily monk chats and weekly meditation retreats–all open to the general public. What could be more unique than hearing about North Thailand’s culture and religion firsthand from a young monk, all he gets to practice his English with you?! Monk chats take place Monday through Friday, 5-7 PM; while meditation retreats start every Tuesday at 1 PM and conclude Wednesday by 3 PM. Visit MonkChat.net for more details, up-to-date schedules, and other special events. For a full list of Chiang Mai Temple Tours check out get Your Guide Day Tours. They offer last minute bookings and easy cancellations. Extra tip: other popular Chiang Mai temples (i.e. Wat Chedi Luang, Doi Suthep, Wat Umong) also offer monk chats, so feel free to visit them all for different perspectives! This was one of our favourite experience in Chiang Mai. We caught an early morning Uber (GrabTaxi now) to the mountain located outside of Chiang Mai to watch the sunrise over the hills. Located 15 km from the city, we highly recommend taking a GrabTaxi and have him wait for you. We spent about two hours walking around the complex. Getting there early in the morning avoids the crowds and you are free to explore the temples and views in solitude. Be sure to cover your legs and shoulders and you walk the grounds with bare feet. We were let off by our driver and walked the 309 steps to the complex where we were treated to an extraordinary panoramic view of Chiang Mai and a stunning scene of golden temples. Legend has it that the temple was built to house a bone from Buddha's shoulder. 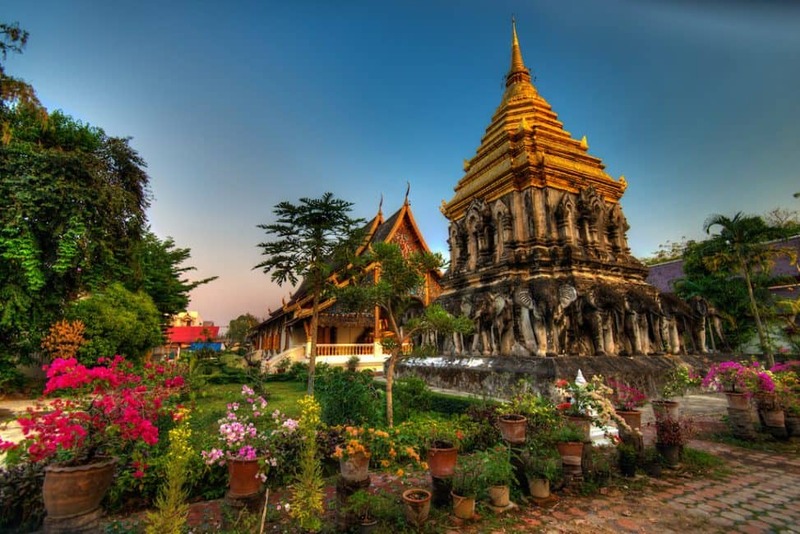 When visiting Chiang Mai there is no doubt you will visit the old city to explore its temples. Surrounded by a moat, a brick wall surrounds the old city that is filled with an astounding concentration of temples. 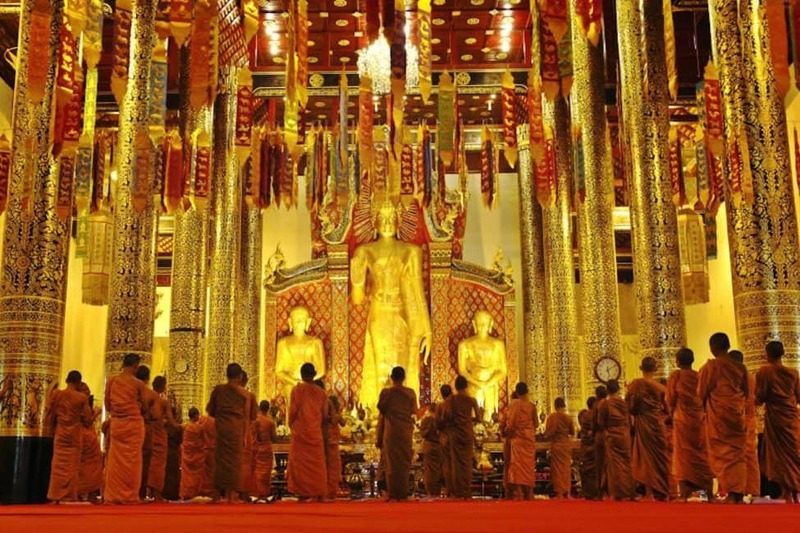 Chiang Mai is the top place in Thailand to visit temples. 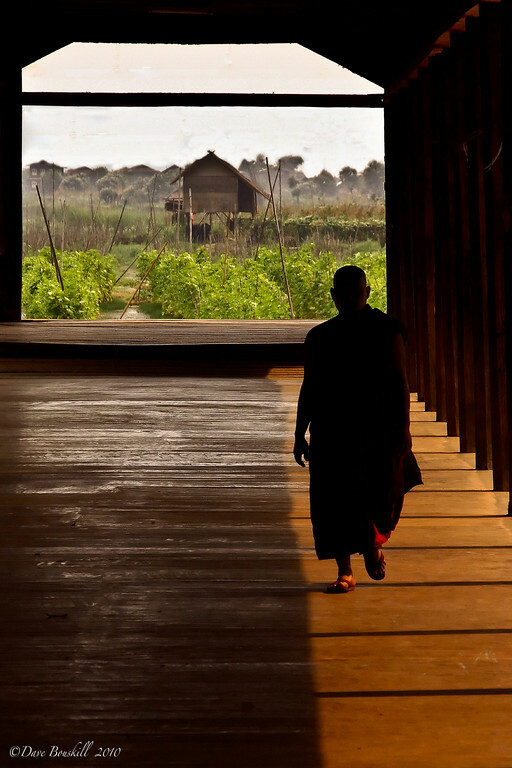 Monks go about their daily business. Don't be afraid to wander into a temple. The entire fun of visiting Chiang Mai is to explore by foot and get lost. Night Market Tour - Chiang Mai is renowned for its night market where you can buy Thai crafts, knock of hand bags, watches and really anything under the sun. It is a 1km stretch of stalls lining the streets along the East Side of the walled city. It's open 7 nights a week. Thai Cooking Class - Chiang Mai is cooking class central in Thailand. Learn to cook yoru favourite dish so you can make it when you return to your country. Thai food is our favourite food and we now cook it all the time at home. Waterfall Expedition - Doi Ithanon National Park is a great day trip and this is where you can play in the Vachiratharn Waterfall. Wat Suan Dok and the other 500 wats in the city - Take a guided tour to see Chiang Mai's most popular temples. 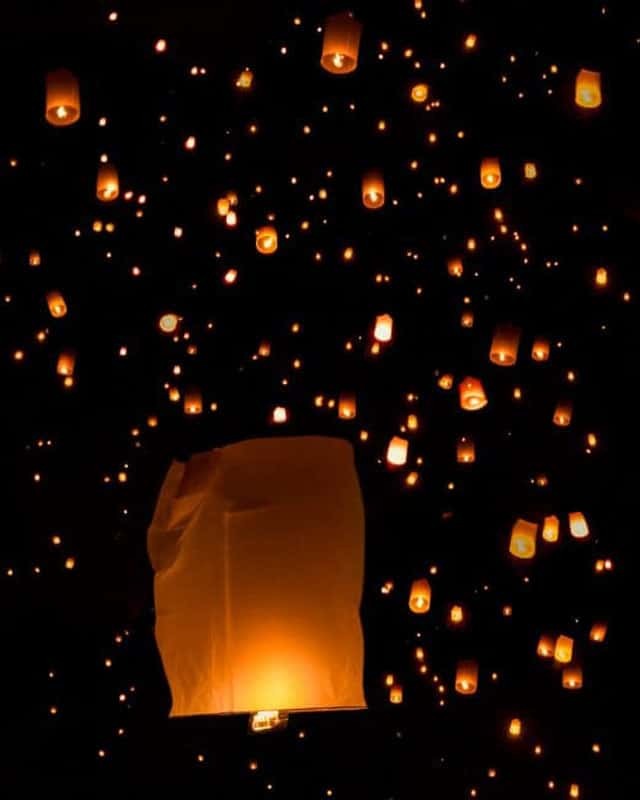 Chiang Mai is famous for its Lantern Festivals. Loi Krathong and the Yi Peng festivals happen in tandem and it is a magical time to be in the city. Dave and I were there for the festival held each November as thousands of lanterns were sent soaring into the air. It's a confusing event where you have to ask a lot of questions and pick a lot of brains to find out where the lanterns are being released. No one person has the same answer. If you want to book a place in the stadium to let lanterns off with the masses, you need to book several weeks or even months in advance. Note: We noticed the lanterns were put together by metal. Be sure to use bamboo lanterns that are environmentally friendly. Chiang Mai is famous for its cooking classes and northern Thai cuisine. Whether you book a cooking class, join an Old Town foodie crawl or simply visit one of Chiang Mai’s night markets, you have to try Northern Thai cuisine. I was introduced to the region’s delicacies by Chiang Mai Food Tours and have to say, it is my favorite type of Thai food! Also known as Lanna food, regional dishes in this part of Thailand are quite a contrast from those found in the South. Not only are dishes around Chiang Mai typically the least spicy in the country, but also commonly rich in dried spices and/or bitterness. Don’t be wary, though: Thais have an incredible ability to pair seemingly-off-putting flavors in order to create a delicious, aromatic concoction. When Dave and I first traveled to Thailand, we took a meditation course. The course lasted three days and we had a cooking class included with it. We booked through our guest house which is very easy in Chiang Mai. 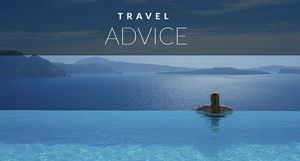 You can also book tours at travel agents around town. They are all very easy to find lining the streets. It was a wonderful experience. 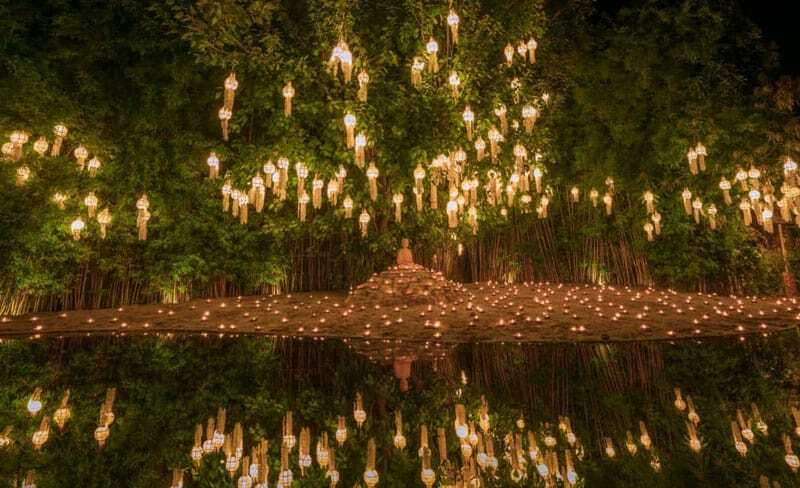 Chiang Mai is the premier place in Thailand to do a meditation course. It is the spiritual centre of the country. There are countless meditation retreats in Chiang Mai, you can book and read reviews on TripAdvisor. For those who may have already done a lot of the top things to do in Chiang Mai, or who are looking for something a bit different, this section shows the more underrated Chiang Mai things to do that are fun, unique, and fit for most budgets. 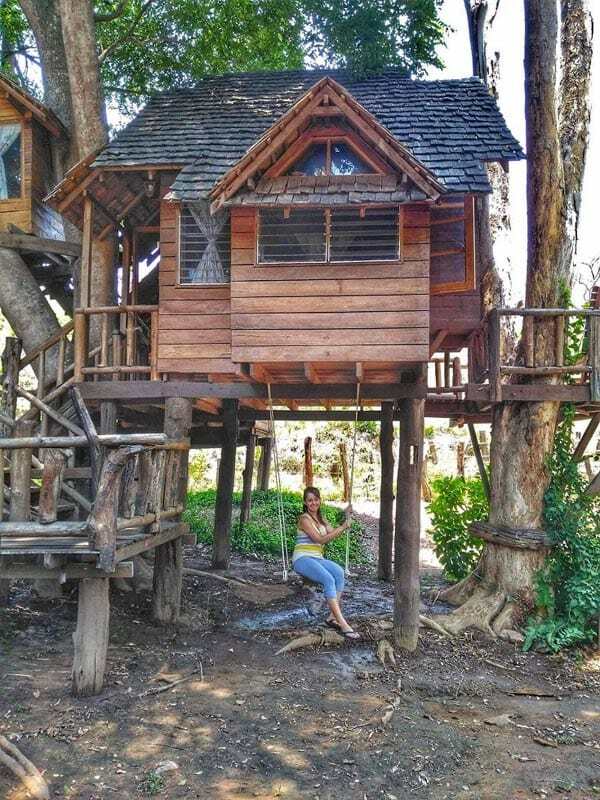 So, you are probably asking what could be so great about staying in a tree house? Well, Hello! You get to spend the night in a real tree house. A house made on top of a tree! You can't tell us that's not tickling your inner child a bit. Seeing kids in movies climbing a laddeer to get to their "secret" tree house and having to say the "secret" password to enter made me so envious. This place made that fantasy come true. For those traveling families with small children, this is a MUST DO. Your kids will love it! As a couple, a two-night stay was romantic, adventurous, and relaxing all in one package. There are several different types of tree houses you can choose from when booking with them. If you pick the Tamarind House, beware that it is the tallest, and you will definitely feel it sway in the wind (especially at night when you are in bed!). You should take note that the Tamarind House is the most sought-after treehouse, so booking in advance is a MUST! 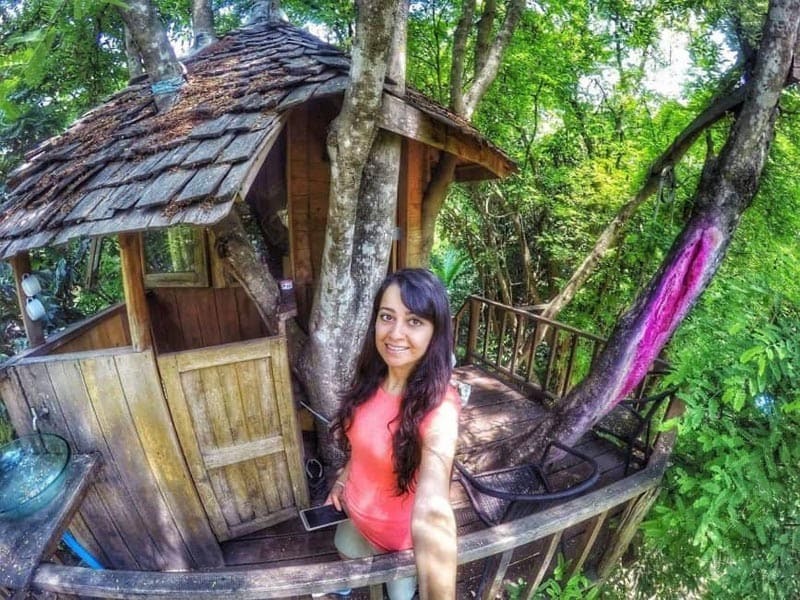 Why Stay in a Treehouse? The tree houses are fully equipped with some nice creature comforts, including a bed, electricity, toilet, sink, and shower. You get that camping feel with a bit of extra comfort. 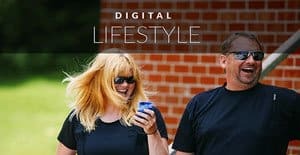 Internet connection isn't available in the tree houses so you'll have to just connect with each other (sounds cliche, but it's a good thing!). Read a book, play some games, tell stories, or just listen to the sounds of nature and meditate. For those attached to social media, you'll have to do your uploads and downloads at the lobby/breakfast area/lounge by the front desk. During your time there you can enjoy some seriously delicious food prepared by the folks that run the place. If you get a little adventure itch, just grab one of their bicycles and go for a ride to catch some panoramic views of the valley, or explore trails that lead to some pretty cool and scary caves in the woods. The number of infinity pools has increased massively in the last decade and it would be remiss of me not to mention the best Chiang Mai infinity pool at Veranda Hotel. 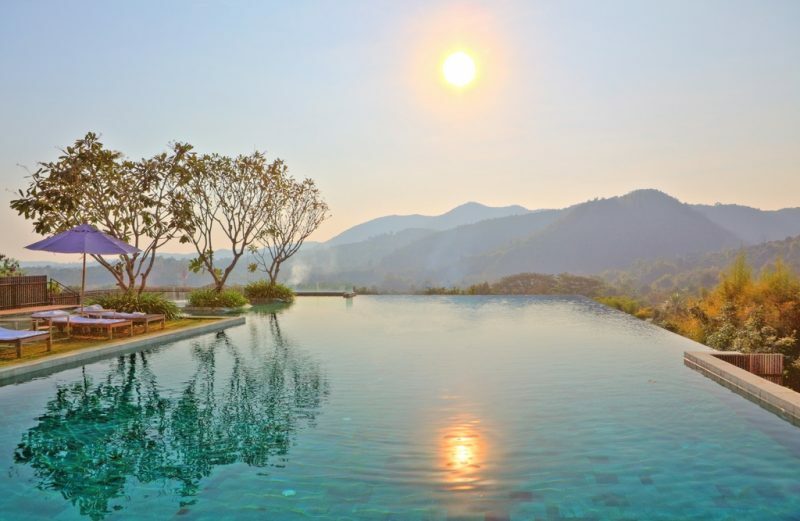 With views over a valley mixed with the hot Chiang Mai weather, you can't not like the idea of taking a dip. There might be a pool at your accommodation, but the whole Veranda experience is memorable. So to enjoy an infinity pool in Chian Mai, you don't necessarily need to splurge on pricy accommodation, you can visit certain pools as a guest. Rather than getting a massage in the crowded, touristy spot, why not in Chiang Mai's only city public park? 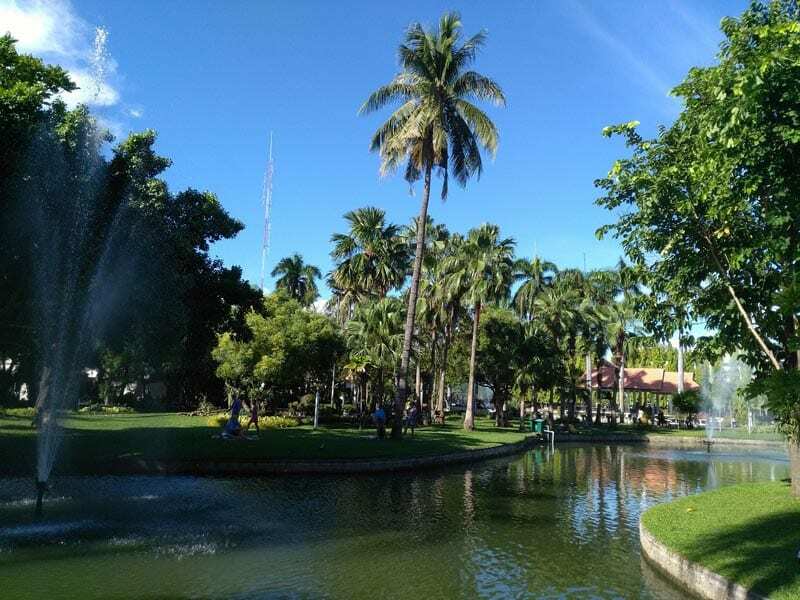 This tiny little oasis known as Nong Buak Haad Park is located on the south-western corner of the Old City and is very easy to get to by motorbike, tuk-tuk, or even bicycle. Though not very big in size, this park has lots to offer. There are a couple of large, beautiful ponds with fountains that are connected by bridges, creating a peaceful atmosphere that can be enjoyed by laying on the grass or renting a straw mat. Get a coconut or snack from one of the vendors in the park and just enjoy your time (make sure you don't go in your bathing suit). You can even buy bags of food for the birds and fish! There's even a small track that runs around the ponds for those who prefer to get a jog in or go for a walk with some nice scenery. Use one of the manual exercise machines on the outer edge of the park. There's even a kids play area! You're sure to find locals as well as expats and tourists at this park. Depending on when you visit, you may even see an aerobics exercise class taking place here. Whatever you end up doing, you will love going to this park. 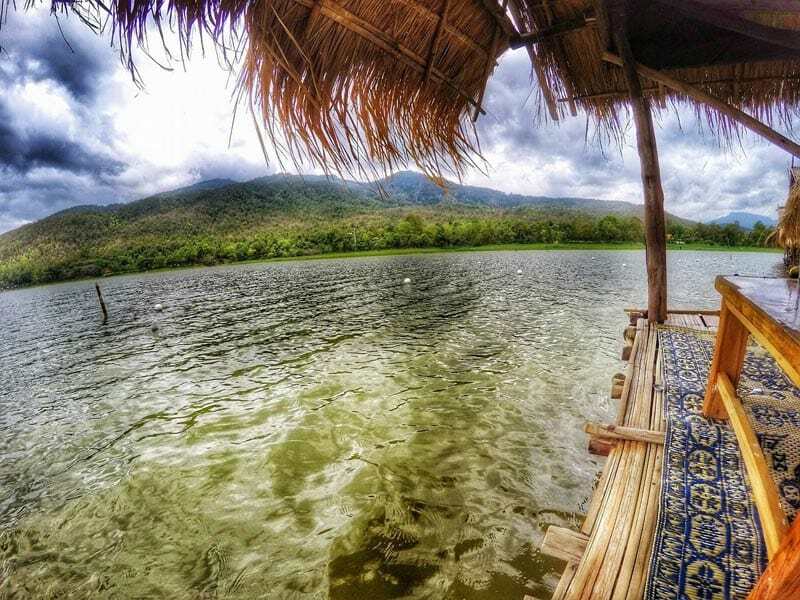 Anyone can visit Huay Tung Tao Lake for a measly 20 baht. On the weekends, you can even hire pedal boats, with the classic swan boat one of several choices. A cold beverage in your hand. A platter of grilled fish and some sticky rice with papaya salad. All served to you under the bungalow over the lake on a warm Chiang Mai day with views of green, lush mountains all around. Getting there: It's about 25 minutes from the Old City and very easy to reach by motorbike or Songthaew, making it a perfect, quick getaway from the city and crowds. The entrance cost is 50 THB per person (less than $2 USD). 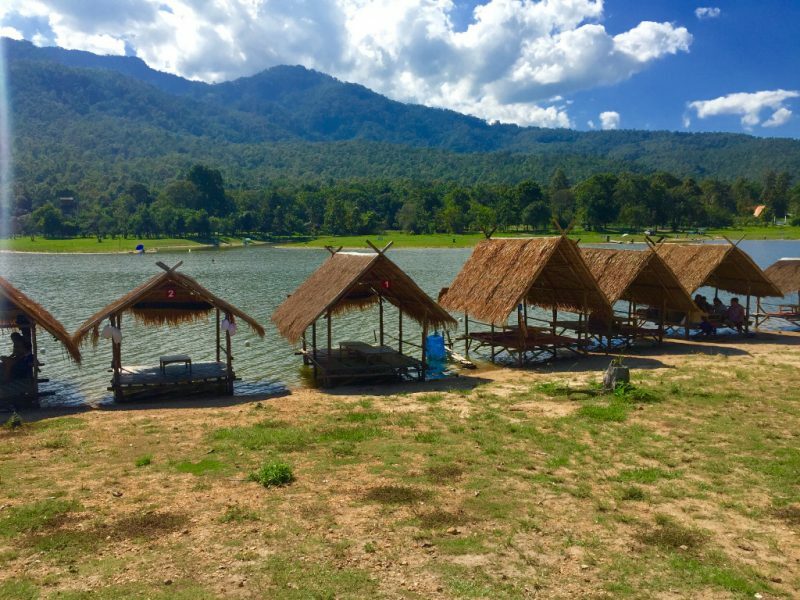 You'll find these bamboo huts dotting the outline of the lake in some areas with restaurants behind them. Choose the one you like and they will bring you the menu in Thai and English. The dishes are usually served family style and very reasonably priced considering the view that comes with it. The grilled or fried whole fish is a popular menu item, so be sure to give it a try. 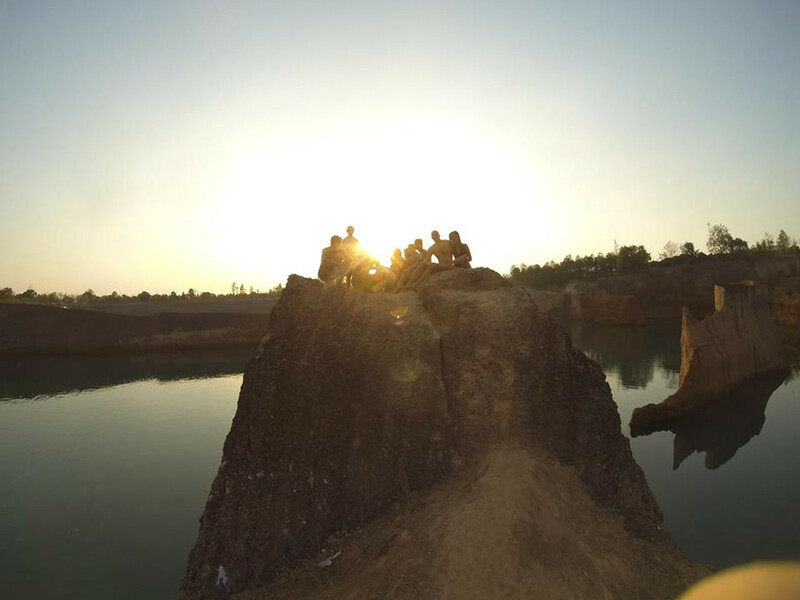 If you're looking for a beautiful sunset spot, consider heading to Mae Kwong Reservoir. The reservoir is just far enough out from the city to avoid pollution. Other popular lakes, though aren't suitable for swimming are found at Chiang Mai University and at the park inside the southwest corner of the moat. The Touring Kiwi Says: Spending an afternoon at Huay Tung Thao is one of his favourite things to do in all of Chiang Mai. 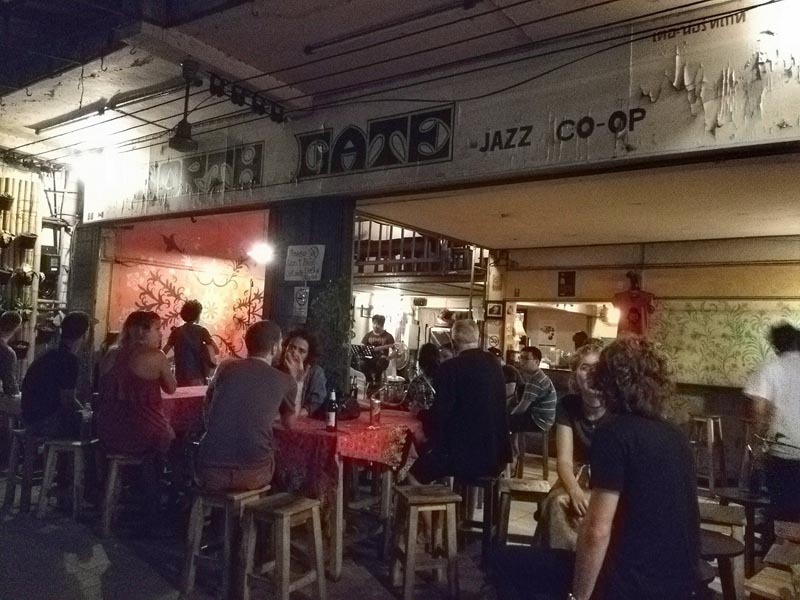 A very chill and laid back spot for locals and travelers alike, the North Gate Jazz Club provides a great end to any fun-filled day in Chiang Mai. Spend the evening hours at this well-loved hangout, located on the north side of the Old City moat. Directly on the other side of the moat, separated by Chang Phuak Gate, are the nightly food stalls of the North Gate. 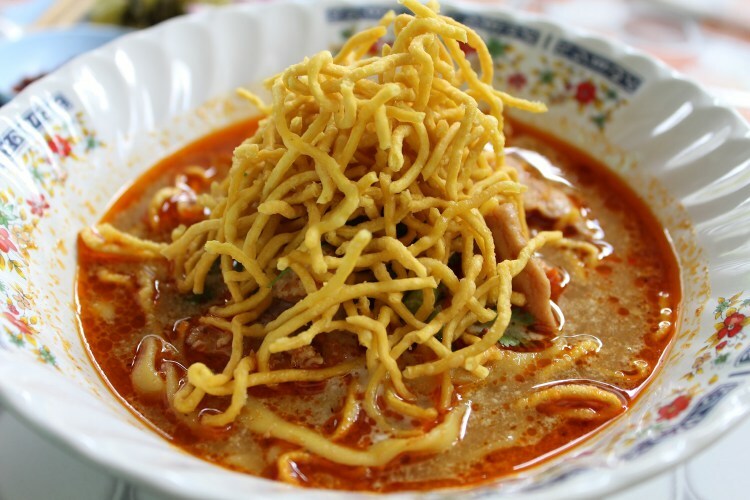 Here, you'll find some of the best street food in Chiang Mai. Be sure to grab some dinner here before heading over to the jazz bar. Whether you've spent the day riding your motorbike around the Samoeng Loop or you've been out sight-seeing the temples, you're likely going to want to find a nice place to sip on a cold beverage and relax with friends to some cool tunes. This jazz bar may not look like a popular joint, but looks can be deceiving. Depending on the night, you may see patrons spilling into the street as the music plays on into the night. They have open jam night on Tuesday nights and different events nightly so be sure to "Like" their Facebook page to get the updates on what they offer. Even if you just pop in on a random night, you'll surely enjoy sipping on a beverage and listening to the jazz. This is a recommendation for those who feel comfortable riding a motorbike in Thailand. It goes without saying that you should always wear your helmet, but also, it would be smart to make sure you have an international drivers' license if you plan on renting a motorbike in general. Having said that, there are loads of female, solo travelers, as well as couples and even groups who take on this adventurous and scenic route around and through the hills of Chiang Mai. It's truly a wonderful experience and a must do for those that love riding on an open road. The loop starts at the northern part of the Old City and drops you off at the western side with a total distance of about 100 kilometers. It can take you anywhere from a couple of hours to half a day to complete, depending on how often you stop and how long those stops last. Doi Suthep (the mountain that accommodates the popular Buddhist temple of Wat Phra That). Activities like ATV-ing, go-karting, and zip-lining. A snake farm along the way! You can spend about an hour at Queen Sirikit Botanic Gardens just walking through the different buildings housing some of the most beautiful flowers and plants from around the globe. There is a fee of 100 THB to get into the park, but riding the Samoeng Loop just costs you a bit of gas money for the motorbike/motorcycle. 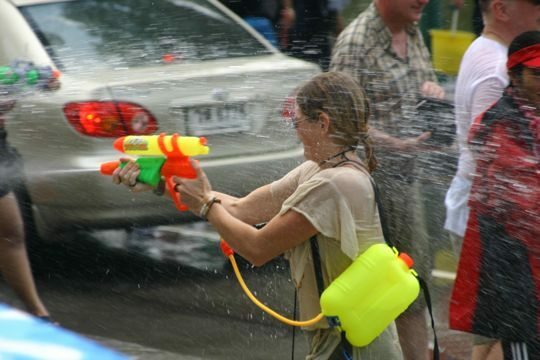 Read about Thailand's Songkran Festival, the world's largest waterfight. We cycled out to the countryside to explore the rice paddy fields in rural Thailand. Our trip took us through the busy streets of Chiang Rai, back roads and small villages. The most fun was when we turned onto a dirt road to climb a steep hill and then whiz down some wicked fun hills through villages and rural communities. These two weeks were some of the best times we have had in all our trips to Thailand. And then we got to take a longtail boat back to town to relax and enjoy the scenery. Smiling Albino took all our interests into consideration to put together a tailor-made itinerary. 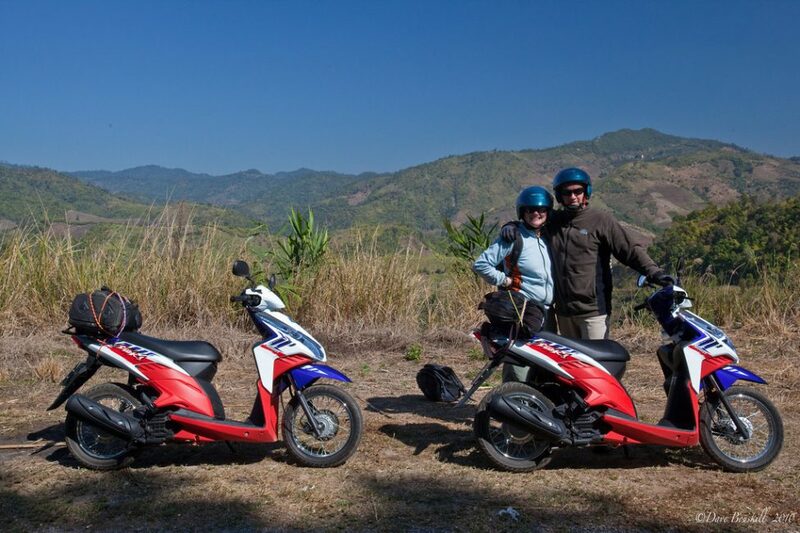 We went on a motorcycle journey to the hills, checked out the tea terraces, went mountain biking, saw elephants and explored both Chiang Rai and Chiang Mai. They fulfilled our every desire. 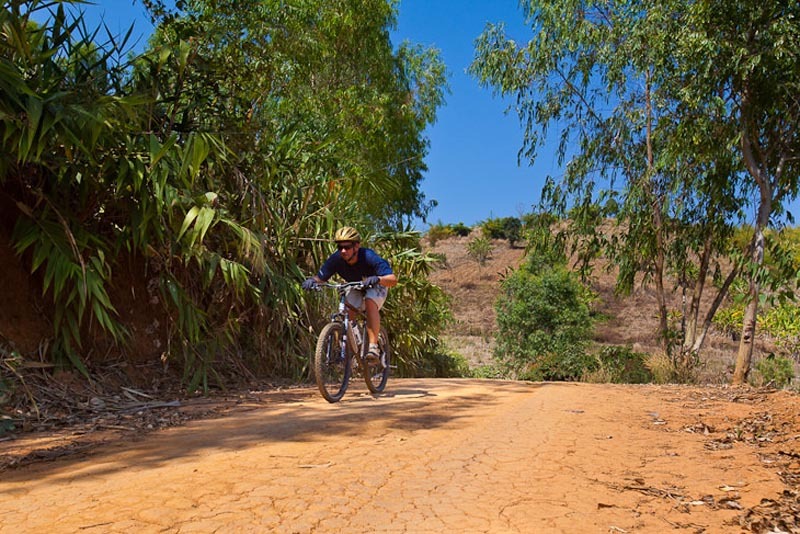 You can book an 8-hour bike tour to the countryside - Easy cancellation up to 24 hours in advance. Thailand's beaches are gorgeous, there's no denying that. Other than relaxing on the beach they provide plenty of water-based activities such as Sea Kayaking, an activity Dave and Deb bravely embraced. But there are a lot of Chiang Mai Activities that take place on the water. With a little bit of digging, you'll find Chiang Mai has some awesome water-related activities. Most countries around the world have scarred land, known as a quarry. Once all the stones and minerals have been extracted, the land usually becomes a barren wasteland. 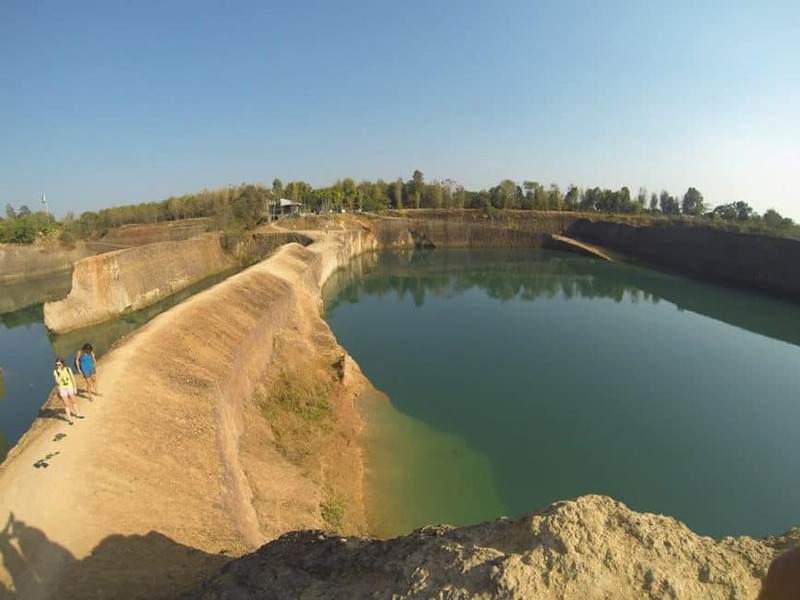 Located just 20 minutes from Chiang Mai, there is a quarry that's isn't a barren wasteland but a picturesque swimming spot. Initially, it was visited by a few locals and expats but has now been converted into a tourist attraction with an entrance fee. The main drawcard is the cliff jumping, where you can plunge into the calm blue waters below. Even if you don't want to jump it's a great spot to hang out with friends, swim and enjoy exploring the quarries nooks and crannies. Note: The water looks harmless, but nevertheless make sure you follow basic water safety practices as tragic accidents can happen. The Ping River runs through the city and naturally becomes a great spot for restaurants and bars. You don’t want to be swimming in the river near the city, however. What you can do is go tubing Vang Vieng style with Chiang Mai Tubing, 45 minutes out of the city. When you arrive at the location, you might think you are on an Island with a whole beach club set up, including a fake beach. Once you are on the river in the comfiest of tubes attached to your friends, you'll have an incredibly peaceful 60 - 90 minutes floating back to the Beach Club. Don’t be in a rush to get back to Chiang Mai, at the beach club you can chill out in the hammocks, play volleyball, football, badminton...all your typical beach games. Thailand has hundreds of waterfalls, but an hours drive from Chiang Mai is the unique sticky waterfall. While physics doesn't make running up a waterfall practical the limestone rocks forming the sticky waterfall make the impossible, possible. It's hard to explain but once you step on to the pumice-like rocks, any doubts go out the window as you bounce up and down the cascading waterfall. Closer to the city, the Huay Kaew Waterfall allows the perfect escape just minutes away from Chiang Mai University with some short hikes available riverside. 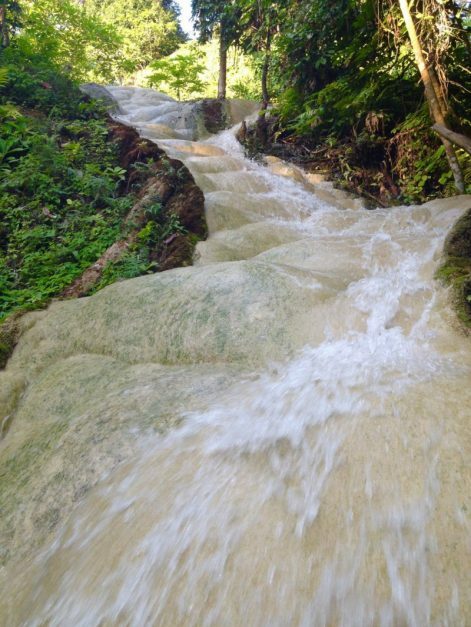 The Mon Tha Than Waterfall is further up the road as well. If you head to the Sticky Waterfall, consider making a night of it by staying at Mae Ngat Dam just down the road. 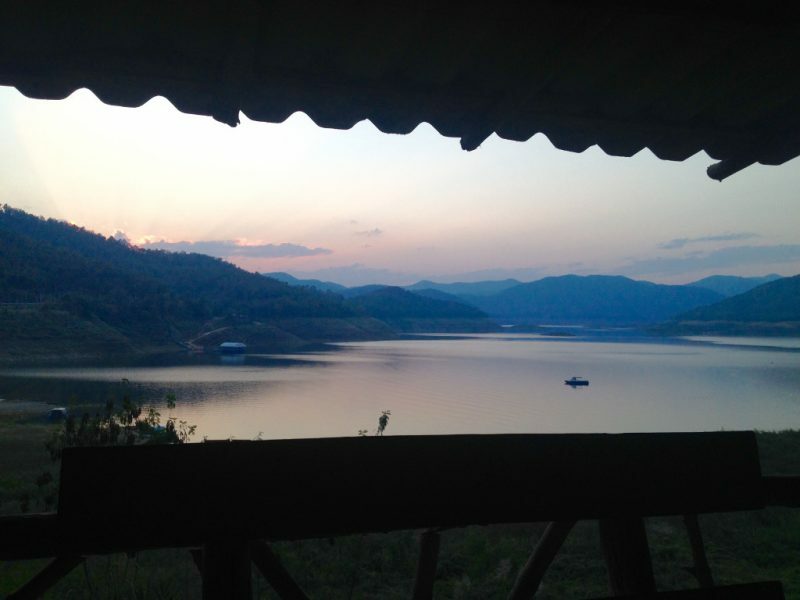 If Thailand has felt overwhelming to you thus far, heading to Mae Ngat Dam can be a great way to relax. And it's not every day you can sleep on a floating house! You can relax on the house decks working on your tan, eat great food, have a beer and of course take a dip in the water. It's one of several hidden gems in Northern Thailand. 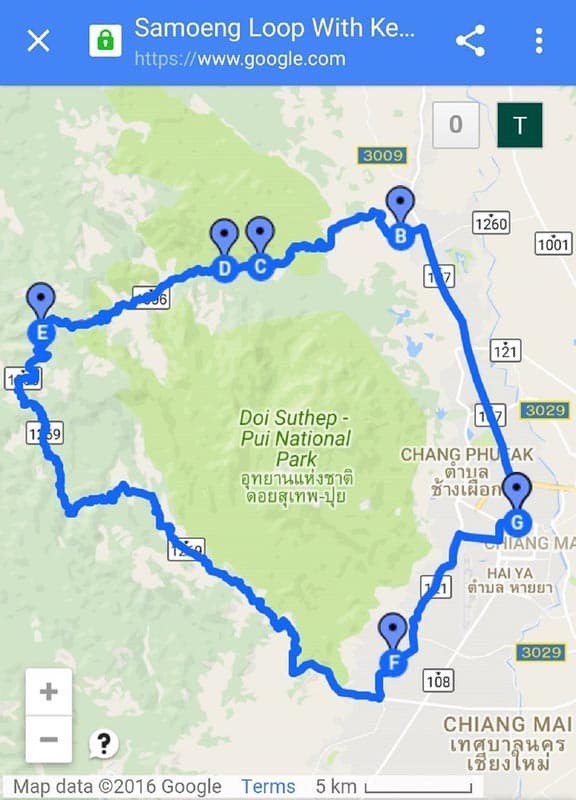 Before I leave you to plan your Chiang Mai trip, make sure you save the map below. Trying to find places on Google Maps in Thailand isn't always easy so I've gone ahead an marked all of the places listed on a map for you.
? No matter where I am in the world, Chiang Mai will always hold a special place in my heart and I'm sure once you visit you will appreciate the beauty of the city too. Before you leave this magical region of Thailand, rise with the sun one morning and see Chiang Mai, Mae Kueng Dam, and vicinity from a different perspective. Sky Adventures offers two types of aerial experiences: micro flights and hot air balloon rides. I took part of the former and let me tell you: it was absolutely breathtaking and exhilarating! It is so open, you almost feel like you’re flying yourself. Pickup times and trip schedules vary by experience and season, but expect to be ready by 5:45-6:30 AM. Micro flights can be booked all year long (always dependent on weather conditions). Hot air balloon rides are only offered between November and March. 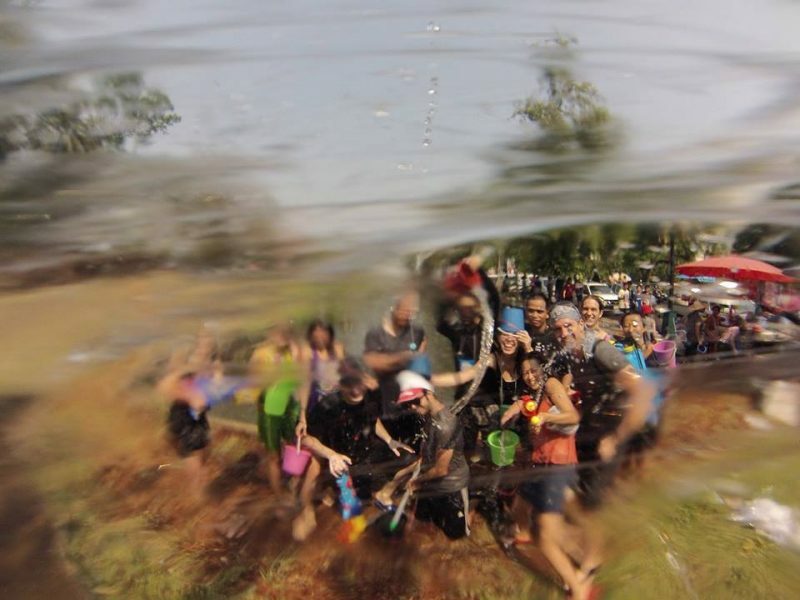 Songkran is the water festival in April bringing in the Thai New Year. Songkran is celebrated all over the country but after celebrating the last three New Years in Chiang Mai I can say it's the place to be. The old city is surrounded by a moat, providing easy access to water and making the chaotic nature of the festival somewhat organised. The festival goes for several days and is exhausting. If you think you'll need a break one day, be prepared to spend the day inside as no one is immune from getting splashed, a form of blessing. Enjoy all these amazing things to do in Chiang Mai? Be sure to pin it for your future reference. Maria Alexandra Laborde is the author of LatinAbroad: The Nomadic Translator and Travel The Middle East. Follow her adventures on Twitter @latinAbroad, Facebook page & Pinterest. Jub comes from New Zealand and is the owner of Tiki Touring Kiwi Catch his daily adventures on Snapchat @jubunator. Instagram @tikitouringkiwi and Facebook. 16 Responses to "Top Things to do in Chiang Mai, Thailand"
Your article is amazing i like the way you organise it in a very interesting and simple way in same time and how a few talented lines with few photos make us know a lot about Changi Mai in thailand its great that in one article we can know too much about things to do, places to visit, best city attractions, culture and food. The great thing about your article that while you are reporting information about Chang Mai you can draw full picture to this destination starting from photos and simple description to places and highlighting on touristic attraction so that the writer can make much more travel blog as he takes your mind and soul to the destination. Keep on am waiting your next precious lines. We are going to Chiang Mai in October and will need to check out those treehouses! Have a great time! Chiang Mai is fantastic. View of the mountain from Thiag Tug boat lake is mind blowing .My kid will love the tree houses . Looking forward for my much awaited trip to Chiang Mai. Great write! I love that you included the Lake!!! So many people have never heard of it, and its definitely worth a stop! And North Gate was one of my favorite night hangout spots, although I would definitely recommend putting to get there relatively early because by 8/830 the crowd is spilling across the street and theres def. no where to sit! The treehouse sounds like a kid’s dream come true! It’ll be on my list for Thailand. I’d love to take a trip someday! Yes! You are so correct! It also just really allows you to use all of your senses and experience a place differently! Ah.. The motorbike ride is something quite different!! I believe, it brings out the adventurous side of a person.